Contrary to popular belief, the Praxis II Elementary Education test isn't a measure of academic performance, which is why many test-takers who achieve perfect grades in college don't always pass it. Studying such a broad range of topics and enduring such a long testing processing can be challenging, so what's the best way to prepare for it? Turn to Praxis II Elementary Education For Dummies with Online Practice! It offers easy-to-follow subject reviews, test-taking strategies and advice for multiple choice and essay questions, sample practice questions, two full-length practice tests with detailed answers and explanations, and more. 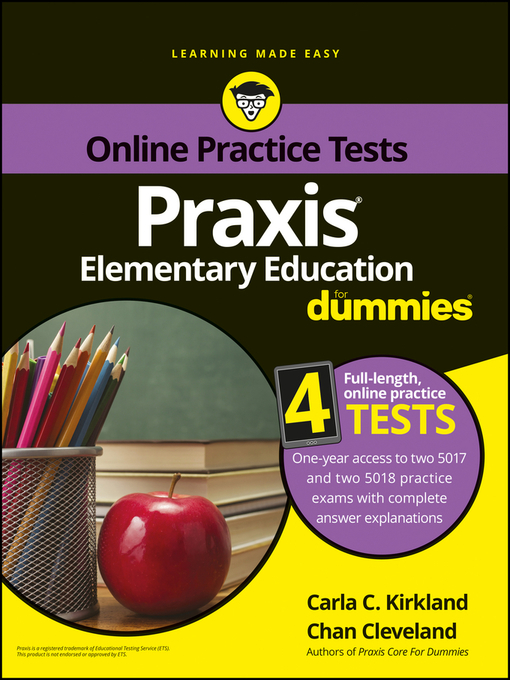 If you're one of the more than 600,000 aspiring teachers who take this test each year, this hands-on, friendly test prep guide gets you up to speed on everything you need to know to pass the Praxis II Elementary Education text with flying colors. This helpful guide covers Reading and Language Arts, Mathematics, Social Studies, Science, Art, Music, and Physical Education. It leaves no stone unturned by offering tips on registering for the exam, as well as a detailed overview of the test and how it's administered. If you're a future educator gearing up to take the Praxis II Elementary Education test, this is your ultimate guide to one of the most important tests you'll ever take.